This initiative also helps us increase the visibility of lithium battery types throughout our network and ensure the integrity of such DG shipments until their final destinations. Add a Shipper’s Declaration for Dangerous Goods which can only be completed by DG-trained personnel. 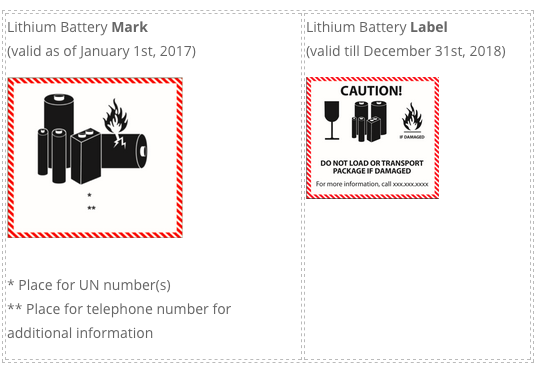 if using the Lithium Battery Label, FedEx requests that you add the UN number on the package adjacent to this label [FX-05]. This will become a mandatory requirement by FedEx on July 1st, 2017. In addition, although this new rule does not apply to individual lithium batteries packed with or contained in equipment (UN3091 and UN3481 as defined in Section II), you will need to follow the same instructions as explained above regarding the inclusion of the Lithium Battery Mark or the Lithium Battery Label. Review all lithium battery shipment packing to ensure it meets IATA packing instructions UN 3480 – PI965 & UN 3090 – PI968.Note that a Dangerous Goods handling surcharge might apply to shipments containing such lithium batteries. Read about the new FedEx Express Lithium Battery Policy Change in the IATA Dangerous Goods Regulations Manual available for purchase at www.iata.org. This also carries information on lithium battery packing, marking, labelling & documentation. May is World Trade month and normally a time when we highlight the benefits of trade to the American economy. The fact is the US economy benefits enormously from trade. If you are following the political campaign you will know there has been a lot of debate about trade and its impacts on our economy. From an economic standpoint virtually all economists agree (one of the rare areas of agreement) that trade stimulates economic growth and raises incomes across an economy. But they also acknowledge not everyone benefits and there are real costs associated with job and career transitions in some affected industries. But most believe that those costs are small compared to the long-term benefits to the economy. Economists point out the impact of trade is really about the re-distribution of jobs throughout an economy – with more jobs being created in the sectors that the US excels in – and there are many of those – and fewer jobs in sectors where other countries are more competitive. This adjustment, over time, makes the US economy stronger, more productive and more competitive globally. A recent study looked at potential workplace adjustments in the labor force related to TPP and found under the most realistic scenario the number of jobs affected would be a tiny fraction of the normal job transitions in the US economy. Under this same scenario TPP’s benefits will outweigh its costs by over 17:1 during the ten year period of adjustment. After the adjustment period, the benefit-cost ratio rises to over 356:1, according Robert Lawrence, the study’s author. The fact that trade creates adjustments in the workforce is not a flaw – that is what is supposed to happen. If there is a flaw, and many economists believe there is, it is that the US labor market is too rigid – it is not easy to change jobs and to get re-trained to take advantage of the new opportunities produced by the global economy. Labor market rigidity does two things: 1) it prolongs the pain for those transitioning jobs or careers, especially those in the second half of their working lives; and 2) it limits the economic benefits of our trade policy because the reallocation of jobs towards the more competitive sectors does not happen as fully or as quickly as it should. Making the US job market more fluid and flexible – and better able to adjust to inevitable evolution of the global economy should be one of our top economic priorities. What would be helpful is a comprehensive and balanced review of US labor and tax laws, as well as our education system, to come up with a modern and effective set of measures to help workers transition and get the training and education they need to take on the new jobs that our economy is producing. There are millions of jobs that go unfilled today because we don’t have people with the right skills. These kinds of initiatives would help the U.S. better realize the gains from trade and increase the public support for trade. This is actually how trade is supposed to work – some small portion of the benefits is used to help those most affected. There can be no doubt that protectionism is the wrong solution. Raising tariffs hurts the economy, especially the middle class, by raising prices, reducing choice and limiting competition. The fact is the U.S. economy became the strongest, most innovative and most competitive economy in the world because we embraced trade and rejected protectionism. That’s a platform for success that we should all embrace. Higher Duty-Free Limits for the U.S. If you haven’t heard much about the Trade Facilitation and Enforcement Act of 2015, you’re not alone. The bill was just passed by Congress, and while it didn’t get a lot of attention outside of Washington, the positive changes it brings are significant. The law will modernize and speed up the customs clearance process in the United States. We know how important efficient customs clearance is to our customers, so FedEx and others worked hard to help get this bill through Congress. One of the biggest changes that everyone will benefit from is the increase in the de minimis level from $200 to $800. This means you can be anywhere in the United States and purchase items up to $800 from anywhere in the world duty-free. Before this bill, tourists returning from international trips could carry back up to $800 of merchandise duty free. But if they shipped those exact same goods, only the first $200 was duty free. This bill fixes this anomaly. This amounts to a huge tax cut for the millions of Americans who shop online for products from Paris to Peru. Having the new duty-free threshold at $800, along with a simplified return process, will now make cross-border ecommerce cheaper, faster and more predictable. This is just one part of a larger bill that simplifies the import process, which is good for American competitiveness. With today’s global supply chains, finished goods are seldom completely made in one country – they have parts and value added from many different global markets. Research has shown when a country improves its processing of imports, the biggest improvement is often in its own exports! So, you can see that in order to compete globally as a manufacturer, U.S. companies need rapid and reliable access to parts sourced around the world – and these new rules streamline that process. Just to highlight two examples – the new bill advances the ACE (Automated Cargo Environment) program which moves the United States further towards a fully automated clearance procedure, and also supports the new Single Window clearance system, where importers can file only one set of import documents to receive clearance from multiple U.S agencies. These two changes will help bring customs clearance into the digital age and will have enormous benefits for everyone involved in international trade, especially small businesses. In addition to facilitating trade, the bill also strengthens U.S. enforcement tools. The new rules include increased information sharing between customs and the owners of copyrighted and trademarked goods, and increased training of customs personnel to detect and stop intellectual property violations. It also strengthens mechanisms to prevent customs fraud and improve measures to ensure consumer safety for imported goods. What’s clear is the new rules will go a long way in helping our customers take advantage of the enormous opportunities the global economy presents. By doing so, they’ll also help make the U.S. the most competitive economy in the world. For me, that’s a delivery worth celebrating. At the presentation of the annual balance sheet for 2017, the Deutsche Bahn Group announced a positive development of business at DB Schenker with 71,888 employees worldwide. Despite a strong presence of some competitors, the logistics service provider was able to maintain its market position in European land transport and achieved moderate sales growth to EUR 6.6 billion. The volume transported in Europe increased by 0.8 percent to 100.45 million shipments. Airfreight volume increased by 10.3 percent to 1.3 million tons. Contract logistics recorded a 4.8% increase in sales to EUR 2.6 billion and now manages 8 million m² of warehouse space worldwide. Sea freight accounts for an 8.1 percent increase in volumes to around 2.2 million TEU compared to the previous year. “We have kept word and delivered. However, the pleasing figures cannot hide the fact that we have to improve our quality and punctuality, “said the CEO of Deutsche Bahn, Richard Lutz. DB sales grew slightly year-on-year to EUR 42.7 billion. The operating result (EBIT adjusted) rose by EUR 206 million (+10.6 percent) to EUR 2.15 billion. Rail freight traffic fell by 2.2 percent to 92.65 billion tonne-kilometers compared to the previous year. With a comprehensive concept for realignment, the DB Cargo freight railway is currently returning to a sustainable track. On February 16, 2018, the Chinese New Year begins. It is the most important Chinese holiday, which is why many stores will be closed in China for the next 15 days. To ensure that your shipments to China arrive at their destination without delay and additional costs, we recommend that you plan ahead of time. Exporting Food and Drug Administration (FDA) regulated products to the US has always required shippers to provide mandatory product information set by the FDA on their shipping documentation. Recently the FDA increased the number of data elements required to complete shipping entries which included the addition of FDA Product and Intended Use Codes, preferably as part of the accompanying commercial invoice or on a separate information sheet. These are compulsory and make entering UNKNOWN (UNK) in any category no longer acceptable. The new additions apply to all FDA-controlled commodities – medical devices, human and animal drugs and biological products – with the biggest impact being on medical devices. If any part of the accompanying shipping documentation is inaccurate or incomplete, such shipments will no longer be accepted for entry into the US. As a result, in order to avoid shipment delays, we encourage all FedEx customers exporting FDA-regulated products to make sure their shipping documentation is accurate, complete and fully FDA-compliant. For more information on how to check that your shipping documentation complies with the new regulations, please click here. Alternatively you can follow the guidelines provided on the FDA website. IATA has reported that lithium batteries are now the preferred energy source for many consumer goods ranging from mobile phones and children’s toys to cars and e-bikes. Such shipments are however considered dangerous goods and can pose a safety risk if not prepared in accordance with transport regulations. Click here to get more information. From now on, when you prepare shipments containing lithium batteries Section II (UN3481 & UN3091) using FedEx Ship ManagerTM at fedex.com please indicate which type(s) of lithium batteries you have included in your shipment. As Section II lithium batteries are less regulated than other type of lithium batteries, your selection will help us increase their visibility throughout our network; and ensure the safety and integrity of your dangerous goods shipments until their final destinations. Visit our page dedicated to lithium battery shipping. Read more about lithium batteries in the IATA Dangerous Goods Regulations Manual available for purchase at iata.org. This manual contains information on lithium battery packing, marking, labelling & documentation. The Trans-Pacific Partnership is a groundbreaking achievement and is the most modern, ambitious and economically significant trade agreement the US has ever negotiated. The TPP covers a market of over 800 million people, 40% of global GDP and almost 30% of global trade – and it’s remarkable for a host of reasons. It will eliminate 18,000 duties, including all duties on manufactured goods. This will create thousands of new and improved export opportunities for our customers and more business for FedEx. Lower duties on imports also helps U.S. consumers and businesses through greater choice and lower prices. Remember that, on average, exports contain 40% imported content – this reflects the reality of the modern global supply chains where things are “made in” many different countries. So reducing tariffs on imported parts and materials will actually help make U.S. exports more competitive. This is important because the TPP includes Japan, which is one of the top export destinations for American products, as well as rapidly growing economies like Malaysia and Vietnam, whose growing middle classes will be buying more US consumer and capital goods for years to come. These markets represent real growth opportunities for American companies. The TPP will mean faster, more reliable and more transparent customs clearance. One example – the agreement requires the release of express shipments within 6 hours of arrival. Streamlining customs clearance will help our customers, especially small businesses, get their goods into their consumers’ hands faster, helping them become even more competitive. The TPP expands opportunities for services suppliers, like FedEx, to operate overseas and has new provisions that will help ensure TPP supply chains operate efficiently. This is something that FedEx supported from the beginning of the negotiations. For the first time, an entire chapter of the agreement is devoted to helping small and medium sized businesses take advantage of the TPP. It is a recognition of the vital role that small businesses can and should play in international trade. The TPP also brings trade and investment into the modern, digital age. The TPP is the first agreement to seriously protect an open internet and to ensure the free movement of data across borders, which is important for every business in today’s global economy, and is especially critical to the continued growth of global e-commerce. Finally, the TPP can become the primary platform for deeper and broader economic integration and trade liberalization in the high-growth Asia-Pacific region. Already, countries like the Philippines, Indonesia and Thailand have expressed interest in joining TPP. As more countries join the TPP the economic impacts will continue to multiply. For all of these reasons FedEx strongly supports the TPP and we look forward to its passage in 2016. We will be working with Congress, the Administration, other companies and stakeholders to explain the benefits of the TPP and move the agreement to a vote this year. With continued weak economic growth, we need TPP now more than ever. DHL and Deutsche Post banned shipping by air anything containing a lithium battery. But shipments with lithium batteries up can be sent via FedEx Express (if packed with equipment or contained in equipment). An additional document will be required, wherefore myGermany fully supports you! As per Saudi Arabia Customs Authorities instructions, goods imported into Saudi Arabia require Import of Record identification to be presented at the time of customs clearance. The failing to provide the required documents will lead to a delay until the necessary documents are provided. This new import procedure is effective since September 13th, 2015. All goods with a value exceeding USD 1,000 shipped to individuals require a copy of the Importers National ID (or valid Iqama for non-nationals) when submitting a shipment to customs for clearance. You can back up a smooth customs clearance by putting the commercial registration or ID numbers on the Air Way Bill and invoice. This will help to avoid delays and a potential return to the sender. Please contact our team for that. As per EU regulation of the above called countries commercial declarations are needed when importing goods, regardless the value of the items. myGermany will automatically include the required documents for you! DHL is no longer able to carry Lithium Ion Batteries to Guam. Lithium Ion Batteries can only be shipped via FedEx. FedEx will not deliver packages larger than 68 kg, so no Freight Service possible by FedEx. FedEx informed us that they do not deliver items larger than 30 kg and value higher than 200 EUR to the Russian Federation. DHL will transport whiteout any restrictions. Due to the fragile security situation and increased military activity, DHL has suspended all services to and from Yemen until further notice. All shipments destined for Yemen that have not entered the country so far, will be returned to the sender or redirected upon customer requests. Shipments that are already in Yemen cannot be returned at the moment as Sanaa airport is heavily damaged. Aden airport is closed due to ongoing fights. DHL is closely monitoring the situation and is doing everything to keep service restrictions as low as possible. We will inform you as soon as the situation changes. The restrictions are partly canceled. Shipment of documents are possible. To force negotiations on the working conditions, the largest French air traffic controllers union SNCTA has called its members to strike. The strike began April 8, at 4:00 and is expected to next Friday, April 10 4:00 in the morning. In order to keep any disturbances in the network process as low as possible, DHL and FedEx have responded accordingly. They have changed flights, flight times and routes and programs, where possible, have redirected to alternative transport routes. Despite these measures, delays are possible. Hungarian National Tax and Customs Authority introduces a new electronic control system EKÁER for registration of road transport in Hungary. It’s about monitoring all goods carried on Hungarian roads goods and preventing VAT frauds. For registration with EKÁER the recipient is responsible! Iraq, DHL: please expect significant service delays. In the past days, the military activity has expanded considerably. The situation remains complex, roadblocks, flight cancellations as well as an increased number of security checkpoints making it difficult for us to transport shipments to, from and within Iraq. DHL offices are still open and the pick up and delivery of express shipments continues by taking the overall difficult security situation into account. Therefore, please expect significant service delays. Libya, DHL: please expect significant service delays. The political unrest in Libya continues, the airport of Tripoli remains closed. DHL has set up an alternative routing into Libya but the overall security situation as well as fighting in many parts of the city makes it too dangerous to offer pick up and delivery services at this time. The DHL office in downtown Tripoli is open for customers to collect shipments. Please expect significant service delays for shipments sent to Libya. Due to the situation, DHL do not offer outbound services from Libya at the moment. DHL will do the utmost to minimize service impacts as much as possible but the safety of employees is top priority. It’s Time To Celebrate Extraordinary Women’s!